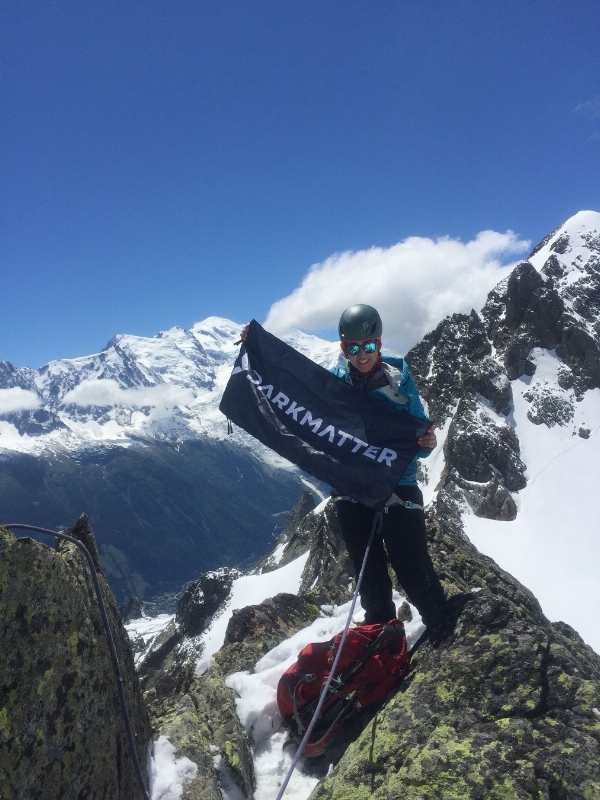 ABU DHABI and DUBAI, UAE: PRNewswire: DarkMatter, an international cyber security firm headquartered in the UAE, recently sponsored a young Emirati adventurer and mountain climber to train in the French Alps, ahead of her making a bold attempt to conquer the formidable Mount Everest in 2017. Danah Al Ali’s inspirational journey, which is highly admired by DarkMatter given the overarching themes of sacrifice, determination, and an intrepid sense of exploration and adventure, saw her recently complete technical mountaineering training in Chamonix, the highest summit in the Alps. During her expedition, Al Ali gained technical experience in walking in crampons on glaciers, snow and rocks; use of ice-axes, and gained invaluable rock-climbing experience. She was also exposed to safety instructions in preparation for her planned journey to Everest. Al Ali’s impressive training course is not the first time she has been held up as a national role model, given her previous impressive physical endeavours. These have included scaling Mount Kilimanjaro, the highest mountain in Africa at 5,895m; climbing Mount Elbrus, part of the Caucasus Mountains in Southern Russia and the highest peak in Europe at 5,642m; and reaching Mount Everest Base Camp in Nepal at 5,335m. Al Ali’s interest in trekking and mountain climbing was first fully realised in 2013, when with the support of her family, she trained for her first expedition to Mount Kilimanjaro in Tanzania. Looking to fully maximise this once-in-a-lifetime opportunity, Al Ali also used her adventure inAfrica to fund-raise for a family through the Red Crescent. In 2014, Al Ali was part of a technical mountaineering course in Chamonix-Mont-Blanc, a resort area near the intersection of France, Switzerland and Italy, while last year she hiked up Mount Elbrus. We work with public and private entities in all verticals to audit and assess their performance against regulatory standards, helping identify gaps and meet obligations. Our elite team of cyber experts, engaged across all competencies and functions, tasked with identifying and responding to the most advanced threats, threat actors, and cyber attacks. We offer a remote monitoring remediation and resolution service that puts the full capabilities and resources of the DarkMatter organisation at the service of our MSS teams. Whether you need a SOC built and operated from scratch or you need assistance in upgrading what you currently have in place, DarkMatter can provide assistance. DarkMatter’s Public Key Infrastructure (PKI) provides consulting to governments on the establishment of national root certificates of trust for countries. This places us in a unique position to understand not only the regulatory environment, but also the broader PKI environment, local players and Certification Authority entities. We also are the only full-service Certification Authority and PKI consultant to be headquartered in the region, and one of only a few to be located outside of North America. DarkMatter’s Secure Communications Suite protects fixed and mobile voice, video, chat, email, file sharing, data communication, as well as device management across various platforms and operating systems. This area underpins our professional services offering for governments and corporations, providing applications, services and solutions that ensure our clients remain at the forefront of cyber security. We offer a comprehensive security suite of services comprising elements of protection for both homes and businesses: The Connected and Secure Home & Office; Technical Surveillance and Countermeasures; Mobile Peace of Mind; and Trusted Hardware supply. Staffed by global experts and headquartered in the UAE, DarkMatter provides peace of mind through consulting and project implementations that are scalable to clients of any size and that address any domain of cyber security threat or risk. The firm also works with leading global companies operating in the field of electronic and cyber security. DarkMatter’s vision is to protect the future by securing its technologies. Agile and innovative, DarkMatter takes a comprehensive approach to helping its clients navigate the complex and ever-evolving world of threat and risk mitigation strategies, tools, policies and systems.